While, scale-free/power-law distributed networks weren’t really the main focus on my research, it did influence what I was doing, as it related to graph-structured databases, where a lot of that structure exists and affects scalability of your analysis. But, more importantly, it influenced a collaboration that I had with another researcher on the same department, Steve Morris. His actual interest was really on power-law distributed networks and his belief was that there was signal to be observed from when a network deviated from being power-law distributed. During one Summer, we sat together and decided that the way researchers were claiming that everything was power-law distributed was by plotting it in a log-log scale and drawing a line through the points. We hypothesized that it was not a very good way to show that it followed the right distribution and we should have an actual statistical test. My proposal was to use bootstrapping and the Kolmogorov–Smirnov test. So we co-wrote a paper on it: Problems with Fitting to the Power-Law Distribution. We didn’t have as much data to play with as the paper that I mentioned above, but we also did conclude that almost nothing was actually power-law distributed. And, until this date it’s the paper that I wrote with the most number of citations (622, according to Google Scholar). The other day I was noticing how many things out there tout to be using AI to solve things today and that's a great thing. That gave me flashbacks of when I started at Amazon, in 2004. Back then I was just finishing my Ph.D. in a machine learning area, dealing with feature extraction on graph-structured databases, keeping a "fond" eye for the future of the web, the Semantic Web, where computers would be able to interact with the web as well as humans and that would be the turning point for what we've imagined as AI back then. From the general population, AI was like 2001's HAL 9000 or the Terminator, a robot/computer that was going to kill us all. For the research, and especially professional population, AI was that dream that people had in the past that just didn't work. But "expert systems" were showing some great results (i.e. very bounded applications for algorithms initially developed, or inspired by algorithms developed for this "AI" field). That even caused some awkward relationships at work. My manager then was a former IBM guy that was working on the AI team at IBM. A lot of people around me disregarded some of the work that we were doing because it was based on the ideas of this "AI guy", so it wasn't going to work. From the general population, the biggest fear is not that it will kill us all, but that it will get rid of all jobs. A way more sensible fear based on things that go beyond Hollywood. In the research field, there is still some reluctance to call AI, as we are not at the "AI" imaged in the 80s and 90s, the one that failed miserably. We are just on a little bit less specific "expert systems" (or really "expert systems" that can learn from different applications too, but still applied to specific applications). On the professional field, people want to say that they do AI to say that they are at the edge of R&D and they are not going to be one of those companies that are going to be replaced by other company's AIs. Yes, just like humans are afraid that they are going to be replaced by AIs, companies are afraid of the same risk. So I think we are at a more sensible place. I personally don't like that people are calling now any machine learning system as AI, but maybe that just softens the expectation of where we are going, making us forget a little bit that goal of this human-like machine that can out-think us. I can live with that! Today I went to AI NEXTCon, partly as a recruiting effort (Sift had a table there) and partly to go to the talks and see what people are talking about. It's a fairly small conference and today was day 2 with 3 keynote speeches and two talk breakout sessions with 3-4 talks each. It's not a cheap conference. I think that attendance costs around $250/day. There are two conference days and two workshop days. So who attends those conferences? It was a very mixed bunch, actually. I saw some people that were fresh out of college looking for a job or to be inspired by machine learning. I saw some people that were there to sell their services (not only the ones that had a booth). There were some software professionals that were not in the AI field but curious to get into it. And there were actual AI professionals from many companies trying to see what is going on. And I think this last class is the one that was probably the most disappointed. Talks were around 50 minutes long, so pretty long. That actually reduced the quality of the talks, in my opinion. Presenters either tried to cover a lot of ground and gave no examples, or tried to give "real" examples and ended up wasting time talking through code that probably went way too quickly to be really understood, but still took time. But I'm not going to mention names. The only talk that I want to highlight was a talk by Amy Unruh, from Google. In that talk, she presented Google's new AutoML. It's still early stages for it, but I think it is a great new direction where ML-as-a-service should be going. I give some company my data and they give me a model that internally is trained with more data than the one I gave them. Hopefully that is done through transfer learning, but maybe there are other tricks that might work in fields where there is no reliable transfer learning solution. The reason why I think it's the future of ML-as-a-service is because this is where the value really is and scales. The pre-trained models are nice, but they are always hard to use in real life. The classes are either too granular, granular in the wrong places, or just not granular enough. Also it has sometimes puzzling errors (the example in the presentation above had actually a label that repeated twice with different scores - unfortunately it's covered in the PDF version of the presentation). So you probably want to focus on the labels you care about for your application and bias training there. If companies can provide you with a way to get the labels you want without having to spend the money to acquire the amount of data necessary to train a strong model, that's the most sticky feature that you can provide people, and still give them what they want. I hope to see more on it soon. Image classification is an "easy" field for it (the problem is pretty well-defined and the inputs are consistent across domains, making it easier to get transfer learning to work). I will cheer more when companies start providing solutions for other fields, like many NLP tasks. Certainly something to keep an eye out for. Great start, Google! Should internet firms pay for the data users currently give away? It is an analysis of a paper "Should We Treat Data as Labor? Moving Beyond 'Free'"
(although the article never mentions where it's from). While I have not read the original paper yet, here are my thoughts on the subject, that I actually even posted as comment on the article. Note that this is a reply from somebody saying that we are being paid for this data already because we are getting things for free that in the past we used to pay for (like GPS). I completely agree that we are already implicitly paying for those services by providing our data. And that should be highlighted in the paper (it might be, but there were no references to the actual paper in the article). I think the component that would make things more interesting is if we can make that explicit and then allow people to opt out of it (and then have to pay for the service). Interesting, but I don't think it would be helpful at the end of the day. Data gathering from users is unbalanced. Some users give a lot of data because they use the service a lot, or have a device that is always collecting the data. And some users don't give much data at all and don't have the opportunity to do so. That means that the internet will become more expensive for some users, which might end up not being able to afford access and all the negative things that that entails. I think that are many other dimensions that might be more interesting to investigate in a legal spectrum (some of them technically challenging): data portability (whatever I give to Google, I can ask them to export to GoogleNext so that they can be competitive and provide me personalized information), data sharing visibility (who gets that data and what are people outside the company allowed to query on), and data security (guarantees on what is available on a person's raw data). That would help foster more competition while keeping data collected transparent and safe and that's better than trying to just go the route of adding more complexity to our interactions with the internet. Economics is hard and I don't really have enough background to say really that the recommendation from the article is a bad one, but it feels like we are really attacking the problem the wrong direction. At some point in the past I was asked to join a team that was handling ads on the Amazon website. My first reaction was that I was fundamentally opposed to the concept because we are muddling the relationship with customers by effectively giving something that we own from the customer (their page view) and giving a piece of it to a different company to profit from. But the reasoning was that this allowed Amazon to monetize those page views more effectively which, in turn, would allow for lower prices on the Amazon website. That made me think about whether you can get the same effective result without the feeling that we are cheating customers to show them not something that they have asked for (and unbiased view that only contains the things that they are searching/browsing on the website). And I wasn't able to really come up with anything better. No, I didn't end up going to the ads team. I decided to join a different initiative within Kindle and my path never crossed again with an opportunity doing ads, so I didn't have to think about it anymore. Correct monetization of things is very complex, so we have sometimes to accept sub-optimal experiences in order for things to move on and, in aggregate, for you to have a better experience. 6 months away from Amazon... How does it feel? As I've mentioned before, after 12.5 years at Amazon, I decided to move on and do something different. You may ask first why I left Amazon. I'll get to that some other time. I want to first start with how is life outside Amazon. More specifically, how is life on a small mid-aged startup (6 years, past Series C) where the headquarters is in a different city where I'm working, and most people in the company have been doing software for less time than I have. That's Sift Science, if you don't quite know what I'm talking about. People: Sift is made of a lot of genuine people, open to feedback and learning. Amazon had a lot of those too, but for the most part Amazon's culture focused the attention on people that were aggressive owners: they cared a lot about what they were trying to deliver and that sometimes created a little bit or us vs. them behavior. Visibility: Sift's business is "simpler" and way more transparent to all employees than Amazon's. Part of it is some level of maturity of the processes and staffing that Amazon has that led to a more complicated interaction between the parts of the business. And part of it is also the size of the product and the required siloing of the decision process. But, for the most part, there is some institutional distrust of people having too much information and that information potentially leaking to competitors. Back to the "people" aspect above, there is no distrust anywhere, so information flows everywhere (sometimes a little too freely, as I can see all closed deals, and ones that fell through). Software Maturity: that's where probably there is a lot more to do at Sift than there was at Amazon. That's expected for a fairly new company with reasonably young software developers. While the overall landscape of knowledge around availability, scalability and development best practices in the software industry has improved tremendously in the last decade, there are some components of the way software is being written that remind me of Amazon 12 years ago: monolithic structures focused on standardization and code reuse with the cost of complexity and unexpected dependencies (e.g. a table around metrics was broken and that prevented work on a job that only did a backfill for ip-to-geo mapping data). Problem space: in this one it's a little hard to compare. At Amazon I was either working for projects that affected other teams (e.g. catalog projects to support category launches, or website feature launches), or things that directly affected customers (Amazon Go). At Sift I'm helping other companies scale their operations by externalizing the concerns about fraud detection. While we have the ability to have very close contact with those customers, in the end the impact to their business is only something we can guess or approximate. So measuring impact can be a little harder. Qualitatively, though, it's a very important problem space, probably more important than any project that I've ever worked with at Amazon (unless Amazon Go actually takes off and causes a change in the way physical retail works - no signs of that yet). Getting feedback from some of our customers saying that they were only able to expand to different geographies because they trusted Sift to be able to detect fraud they were not experienced with and keep their focus on the actual "positive side" or their business is invigorating and not a rare feedback to receive. I'm not going to deny that Amazon is an amazing company. It is honed with building processes and investments necessary to deliver things and learn from it. If that's what you like to do and you are ready to sell your soul to get things done, I strongly recommend Amazon. Yes, it's a large company, which means that there are pockets of everything, but in general it's a relentless environment focused on business optimization and delivery. Sift is not that. It is passionate, quirky, but in general sees problems in a more software-centric route. There is no strong business and process culture, but a culture of looking at the software that we've developed and the models that we've created, and making them better. That sometimes means trying some things that don't necessarily take you anywhere, but there is no feeling of loss when that happens. We just try something else. I don't think I can right now claim is better or worse. It just opened my eyes to doing things differently. Internally I'm still struggling with the adjustment to it, but I can't deny that we have very happy customers at the end of the day, so it's certainly not the wrong way to do anything. Maybe I'll checkpoint my thought process again in another 6 months! To-do lists, calendars, emails to self, etc. and that reminded me of what I just wrote about how I was able to improve my productivity by using a few tools, including to-do lists. So I decided to think a little bit more about it and give my perspective on it. Use recurring tasks as much as possible. They prevent you from having to think about the task twice every time you are going to do it: the first time to write it down and the send time to do it. It's a great contender. You usually have it close to you at all times, and it's where you track the things that have specific time to happen (like meetings), so it would make sense to be the place to look at things to do when you don't have scheduled things. Also calendars have been great at doing recurring events (every day, every Tuesday, etc.). However, calendars are not good at "fuzzy" scheduling. They don't provide prioritization for things that need to happen. They also don't allow for vague deadlines, like within the next couple of days. Finally, calendars are very day or week oriented, while things to do are actually oriented towards the now and the near future. So having a good view of what your availability is in one place is not that easy. Those are great for providing you a view of specific tasks that need to be done, allow you to quickly prioritize, mark done, postpone. They give you a clear list of what needs to be done now and in the future and doesn't really "sweat" about the past. Also, some to-do lists support recurring tasks. On the other hand, they are not very good at supporting the "rigid" part of a person's day. Meetings are still on a calendar forcing you to look at two different places in order to make a decision what to do next. To-Do lists also don't necessarily integrate very well with other tools (like email to link you directly to the email you need to reply to, or document you want to finish). Forcing you to do a lot of extra work to do work. For people where their lives are around emails, having an email to represent a task and using something like Google's Inbox that allows you to "snooze" emails for a day, can allow you to postpone tasks and not lose track of them. Also email provides you with good integration and plenty of space to add as much information as you'd want (including images). On the other hand, email clients are not very good at allowing you to easily prioritize things on your inbox. They tend to be time-sorted and that's it. Also, like to-do lists, they don't capture the rigid part of your day (calendar). Emails don't support recurring "emails". Finally, there is a lot of distractions that come to your email, adding cleaning your inbox to the job of planning your things to do, which is out of your control. You can have an independent inbox just for it, but that can be harder to manage. Paper notepads are very fast for entering new ideas. They can be textual or diagram-based. They also work when your phone has no battery. On the other hand, you need to take them around with a pen, while, in general, it can be taken for granted that you will have your phone around. Re-prioritizing things is difficult. There is no support to recurring events. Moving events to the next day means scratching the event from one page and moving to the next (or something like that). They don't integrate with anything else so you will find yourself doing a lot of moving around between environments. Searchability is an issue, so you have to keep your list short and focused only on the things to be done in the next couple of days. On the other hand, it works best with a board, which makes it less mobile. Also it has the searchability issue. It has some level of recurring approach, but you need to just move the sticky note somewhere else when done. Overall, I actually don't think there is a best solution. I think it depends a lot of how rigid your calendar is. If your day is 80% scheduled meetings, keeping things all on the calendar might be very advantageous. However, if your day is only 10% meetings and your tasks are less scheduled with pressing deadlines, then maybe a to-do list might work best for you. None of them exactly handles artificial scarcity. Maybe there is some scarcity around how many hours you have in a day (real scarcity) or how much you can see on a page, but that's very limiting and doesn't give you a two-directional approach (you cannot do task Y until you do X). For that I actually use a database, but I wished I could solve it all with a single tool. I've been going through a phase of challenging myself to do things that I haven't been doing often and, oddly enough, it has been working pretty well. I've been going to the gym twice a week (well, it's been a week now that I haven't gone, but it's because I decided to hurt myself doing something yet unknown, probably gym-related), work on core strength, improve the health of my back, read more books and scientific articles, and work on projects at home. Unfortunately I still have more things that I want to change! Things are right now very inward-focused (either just me, or my immediate family, or my work). The next step is to expand my horizons, make sure that I don't forget important friendships. I just need to figure out how to keep to the same logic and accomplish those things. Challenges are exciting! Anyway, what does that have to do with blogging? We'll see... I'm actually working now on a company that is not very strict about what I can write about and what I can't, like Amazon was, so that's one of my outward-focused things that I'll try to cultivate. First thing probably will be a blog post about being away from Amazon for 6 months and how that feels. Soon! A week ago or so I received a robo call from Comcast/Xfinity saying that my current cable modem as too old and it will not support the speed improvements that they were doing with their network. But I was eligible for a free upgrade and I had to reply to some mail that I was going to receive or go to some website for more information. When you receive a message implying that my internet could be faster, of course I complied and requested a new cable modem. And that cable modem arrived yesterday. Support for their phone service: if I decide to use the Xfinity phone service, I don't need a new box, they just need to activate it and I connect a phone to the back of it and I'm good to go. It's not trivial to turn it off. I can't even turn off the WiFi that comes with it to use internally. I already have WiFi at home and I spent a lot of time having to expand my network to put the WiFi in a place that the whole house is able to work, and that's not anywhere close to where the cable modem is. It's actually interesting what is going on with user interfaces... Basically little by little, everything migrates to WYSIWYG-style. Squarespace 6 was a step in that direction but created a very strange environment in which you could edit the site "inline" or on a different UI. And some things would be editable in one place, others in another (e.g. sidebars would be configured in one place (show/hide/left-right), and populated in another). It was very strange, but, at the same time, it would make it cleaner to see the preview without a lot of menus appearing when you mouse over things, etc. Now Squarespace moved to their version 7 and pretty much got rid of the non-inline editing mode. Now all my edits happen directly on the preview. It's pretty cool as a technology, but it does bring an interesting set of challenges. For example, on the SJC website if I hover on the menu on top in edit mode, there is an overlay of "Navigation | Edit" that actually covers part of my menu! Also sometimes my mouse is hovering on something and I don't notice and suddenly there is "extra content" on my page that I didn't expect. But it does streamline editing. I haven't played with it that much, but I think it's a step on the right direction. The most important thing that they did right this time, that they couldn't do with the Squarepace 5 to 6 transition is that it's a feature that I can turn on for my website and not a matter of redoing the whole website as they required for the previous transition. Great job, Squarespace! It's now 5775, huh? That's amazing how an year can go by that quickly. 5776 was an amazing year. A lot of stress, a lot of learning, a lot of changes. 5775 is likely to be completely different from any other year. Work will still be there and still be busy. Outside that, nothing will stay the same. But that's a good thing! Looking forward to it. Besides that, I don't really have anything new to report. A lot of ideas going through my head right now, but no way to actually act on any of them. It's probably the sleep deprivation causing my brain to go into an overdrive of sorts. Probably they are all really bad ideas, which is something that also happens when you are sleep-deprived. Anyway, Shanah Tovah everybody! And ready for a week of reflecting about my past year. I think this one is going to be easier than the last couple. my readers would apprecioate yiur work. If you're even remotely interested, feel free to shoott me an e mail. Spelling: if you want to try to get somebody to guest author in your blog, or something like that, make sure you are a good writer so that people want to be "seen" with your posts. Topic: my blog post is about ontologies about recipes and not recipes themselves. The "person" that commented comes from a blog called "Thai recipes", which doesn't seem to be very related. Lack of specificity: if you are trying to convince somebody to join you, you should be a little bit more specific what you think can be the help on both directions. ebook? I didn't get the reference to writing one. Why would I be flattered if somebody asks me if I want to create an ebook? Anyway, I don't even know my password to access that blog anymore (probably I could recover it if I really wanted to), so I don't plan on doing anything else about it. I should get back to thinking about recipe ontologies, thought. It was a great source of entertainment. I just need to first get to having time. Today I did have time, but was spent dealing with my backlog at work from my 3-week paternity leave/vacation. Just as a small aside, I've also purchased elangoldstein.com. Yet another thing for me to think what I'll do with it. So far it's a blank page. Sorry other Elan Goldsteins. If you are concerned about it, contact me and we can figure something out. Transform michelgoldstein.com into a disambiguation page for all Michel Goldsteins out there. I "know" one (that added me as his friend on Facebook just randomly) and I know others exist out there. What I really want to do is #3, but the problem is that I don't think people really care about something like that. I'll spend a good amount of time working on it and in the end I won't get any other Michel Goldstein to actually be interested in being listed there. Anyway, as I mentioned in the previous post, probably I won't have time to think about it for a few months. Maybe after that time I'll have a better idea of what to do with it. It's funny that the last post was on a 2013 retrospective. Anyway, lots of things this year so far. But the most important is the very soon life will be much changed. It's hard to quantify what "very soon" means here, but it's very likely in less than a week, and could even be today. Am I ready for it? Nah, but I guess I'm almost as ready as I could be. What's next after this? What about my projects that have been mostly abandoned anyway? Well, they certainly won't see much difference for some time. But my hope is that this transition will make me be home more, and by being home more, I'll do my projects more. Not for the next few months, but after that (if work doesn't ramp up being crazy again). Talking about work, how is that doing, you might be wondering. It's all going well. Still excited about what I'm building, but still building something I can't talk about. I'm interviewing a lot also as my team is still growing. I'm going through bar raiser training too, which makes me be involved even more on interviewing. Always reasons to learn new things. Hope to be here more! One thing it didn't lack was effort. I've worked hard for those "non-resolved achievements" and they are still underway. I'm still working on a secret project at Amazon that hasn't launched yet. I can't really talk about when it's supposed to launch (even if I knew that answer), but I can say that we are working hard on it and the team is still growing. Now that we've gone through theme one, even if very vague and hand-wavy, let's move on. King of Tokyo: easy to play, a little too luck-driven for my taste. Always fun, though. Ticket to Ride: well, I had to add this one as it's pretty much the only game that I've been able to play lately with Amy. It's fun, though. There is some luck involved, but strategy and being able to read your opponent's goals sometimes helps on offsetting that luck component. Does play better with more than 2 players, which is something I don't have a lot of opportunity to do. There are a lot of games that I've played only once and I wished I had played more, like Guildhall, Flash Point, X-wing... And some games that I bought and I haven't played yet. Another game-related thing that I did was organizing a Magic: The Gathering tournament at work. It was quite a lot of fun, even though attendance was lower than I was hoping for. Well, that's my industry, but I have to admit that this year I was paying more attention to what was happening in the tech world than around the rest of the world. Multiple times I was surprised by people asking me if I had seen what happened in some place in the world and I had no idea what they were talking about. Maybe I'm in the US for too long and starting to not pay attention to what is going on outside my world. I hope to revert this tendency for next year. The world is not square! So the wood might not be square, or the floor that you are trying to place the furniture on might not be square. If you don't know the "fundamentals" of the furniture hardware that is available out there, it's hard to make the right design decisions. There are lots of parameters around a door hinge or drawer rollers that are not evident when you buy the piece. Only when you try to install you notice that things don't really work the way you thought they would. Fortunately my 3D printer helped me a lot on making small adjustments to things. And I think that mostly sums up what I think was different this year compared to previous years. Some things are still the same, like cooking (and I've been potentially cooking more lately because Amy has been through some challenging food restrictions that limit what we can eat out), playing computer games, watching Sci-Fi/Fantasy TV shows and reading books (even though I have done less of the latter than average). My electronics projects have been moving slowly. Going to Brazil and hanging out with family and some friends in end of August/early September. 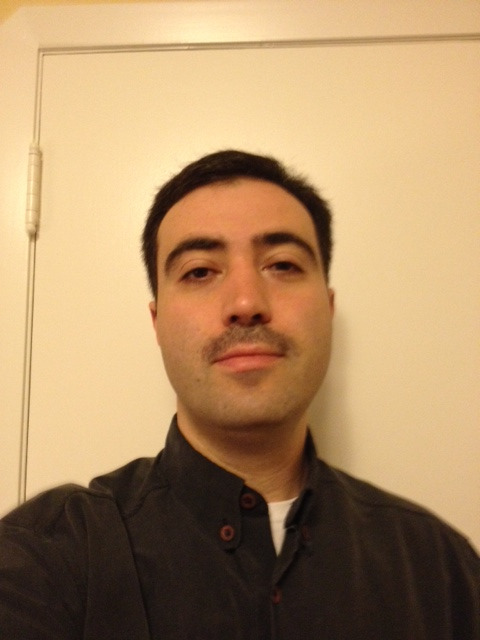 Participated in Movember, even though I didn't raise much money on it. In any way, I'm very grateful for all my friends that did contribute to it. Not a huge year, but at least there were things that were put in motion for next year to be at least as interesting. So far it seems like I'll be going again to Brazil towards the end of the year to celebrate my grandmother's 90th birthday. No tickets booked yet, but it's the current plan. Hopefully I'll have time to see more of my friends this time! It's basically an adapter to the iPhone to allow it to shoot and view 3D videos & pictures through image splitting. Basically they split the camera into a left and right, and then split the screen between a left and right and the device has a viewfinder that makes you see each eye separately. It's pretty ingeniously simple. No electronic parts, just plastic, mirrors and lenses. So what is interesting about 3D pictures/videos anyway? 3D on TVs is pretty much dead. Sorry for you people out there that bought one and now are dealing with the dropoff on new content for it. It's still an interesting technology, but it's just hard to convince people that watching TV is "serious" enough that it's worth getting special glasses and paying attention in a certain way. For those active glasses you need to make sure the battery is charged, and pay $20-$50 for a new pair to let more people watch your content. It's a pretty steep convenience fee. So if I'm so down on 3D technologies that are not convenient, why am I so excited about Poppy? Not an easy answer here. First, I'm still interested about the technology and what 3D data can add to a scene. It's odd that if you look at each image individually, it doesn't seem to have as much quality of details as you can see on the combined 3D image. It's all perception. And perception is everything when talking about vision. It's not the best thing since my first DSLR, for sure. It's bulky, not the most comfortable viewfinder, having to remove the phone from the device to unlock it is problematic. But it requires no batteries, no new place to store my pictures (even though looking at the pictures without their app is a little "boring"), and, hey, I helped them launch! I was even an early bird backer! As I said, it doesn't look that clear. But if you had a way to see it split into two eyes you'd suddenly notice the details. Anyway, there it is and I'm excited about it. Will let you know if I find some way for other people to see it. They said that I can build wigglegifs, but I cannot find how to do it in their app yet. Maybe it's a beta feature that hasn't been approved by Apple yet. Will post it when available. One might think that they would either be pretty similar, or their difference would represent books that are still not available in Kindle format. I found actually that it's not true (and I've heard about this trend before): Kindle books are flooded by romance books. It almost feels like 50% of all the top 100 books are romance novels! That's not a real number. I thought of counting them, but I actually can't tell by just looking at the cover and title what the books are about. And I didn't have the time to go one by one and see what they were about to generate a count. Just go and look. It will be quite evident. The conclusion for me is that if I want to see what the interesting books are according to Amazon customers, I should look at the print ones. There are some that you won't find in Kindle edition, or that don't sell very well on that format. Namely cookbooks and diet books. I have a few in Kindle and I have to admit they are hard to use. I'm sure people have thought about it, and have tried to work on it in the past (and are probably still working on it right now). It's a tough one to figure out. If you want a searchable book, the internet is so much better and more comprehensive. Cookbooks are books you browse to be inspired, and going a page at a time, or jumping through well-defined paths makes this "browsing" hard. Anyway, if you hoped you were going to see my list of best books of 2013, sorry to disappoint. I'm not sure my 2013 list is very good. I actually haven't read too many books. Perhaps because some of the books that I read took a long time to finish (like A Dance With Dragons or The Curse of Chalion). Or maybe I just have been reading more papers trying to catch up with what has been going on in the world of research while I was focused on other things. Next year so far doesn't look like it's going to be much better, but things can change. Perhaps I'll choose shorter books! I'm trying to raise awareness to men's health issues. I'm trying to help to raise money to support research and programs around men's health issues. And I'm open for suggestions of what to do with my mustache. Whoever donates (even if it's just $1) can post a vote (in the comments on the above page) on where I should go with it. Note that I don't have that much time to grow crazy things like handlebar mustaches, so I don't even go there. And Amy will always have the ability to veto whatever is suggested.